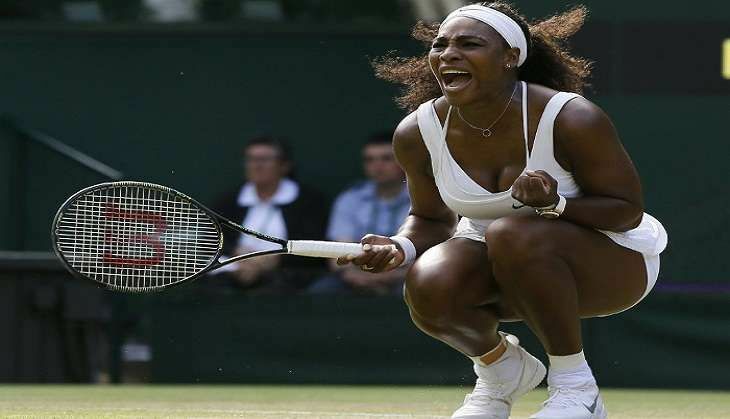 Serena Williams sped past another milestone en route to the US Open fourth round as men's contenders Andy Murray and Stan Wawrinka clawed their way into the last 16. World number one Williams dominated Sweden's Johanna Larsson 6-2, 6-1 to surpass Martina Navratilova for most Grand Slam match wins by a woman with 307. Not only has she surpassed Navratilova, she matched Roger Federer's mark for men. "To be up there with both men and women is something that's super-rare, and it actually feels good," said Williams, who said she was "really excited" to reach 307. "Obviously I want to keep that number going higher," added Williams, who will get her chance when she takes on Kazakhstan's Yaroslava Shvedova for a quarter-final berth. In the one hour it took to subdue Larsson, Williams again appeared untroubled by the shoulder injury that has slowed her since her Wimbledon triumph. "It definitely feels solid," she said. "I'm doing a lot of work on it so I can keep it in this position." While Williams encountered little resistance, it was another story for the top men's seeds in action. Wawrinka, a two-time Grand Slam winner and twice a semi-finalist in New York, had the closest call, saving a match point in a 4-6, 6-3, 6-7 (6/8), 7-6 (10/8), 6-2 victory over Britain's Dan Evans. The 31-year-old third seed saved the match point at 5/6 in the fourth set tiebreaker, breaking the will of his 64th-ranked opponent. "It's always good to win by saving match point. It's always something special, that's for sure," said Wawrinka, who had his left ankle taped after twisting it during the match. "It was a tough battle and I'm happy to get through." Many of Murray's troubles against Paolo Lorenzi were of his own making as he allowed the energetic Italian journeyman to make him look ordinary through two sets before pulling himself together to win 7-6 (7/4), 5-7, 6-2, 6-3. "I had to stop rushing," said Murray, who arrived at the year's final Grand Slam off victories at Wimbledon and the Rio Olympics and may have expected less from Lorenzi, the 34-year-old who only won a first ATP title in July. "I was making a lot of unforced errors and (Lorenzi) is very solid, and doesn't give you cheap points," Murray said. "I was looking for those cheap points too often." Murray takes on Bulgarian Grigor Dimitrov, a 6-4, 6-1, 3-6, 6-2 winner over Portugal's Joao Sousa, for a quarter-final berth. Wawrinka next faces 63rd-ranked Ukrainian Illya Marchenko, who advanced when a hurting Nick Kyrgios, hobbled by a painful right hip, retired while trailing 4-6, 6-4, 6-1. Kyrgios, the 14th seed from Australia soldiered on after receiving treatment at the end of the second set before opting out at the end of the third. Sixth-seeded Kei Nishikori of Japan, two years removed from his run to the final, rallied for a 4-6, 6-1, 6-2, 6-2 win over France's Nicolas Mahut. Nishikori, who has dropped a set in each of his matches so far, will take on Ivo Karlovic for a quarter-final berth after the towering Croatian defeated 19-year-old American Jared Donaldson 6-4, 7-6 (7/3), 6-3. Juan Martin del Potro, whose career was nearly derailed by injuries after his 2009 US Open triumph, fired 37 winners in a 7-6 (7/3), 6-2, 6-3 victory over Spanish 11th seed David Ferrer. He next faces eighth-seeded Austrian Dominic Thiem, who celebrated his 23rd birthday with a 1-6, 6-4, 6-4, 7-5 victory over Pablo Carreno Busta of Spain. Women's fourth seed Agnieszka Radwanska advanced with ease, dispatching France's Caroline Garcia 6-2, 6-3 to set up a meeting with Croatian Ana Konjuh, a 6-3, 3-6, 6-2 winner over American Varvara Lepchenko. Hungarian Timea Babos put a scare into Romanian fifth seed Simona Halep, surging back in the second set and taking a 3-1 lead in the third before falling 6-1, 2-6, 6-4. Halep, who fell in the semi-finals to eventual champion Flavia Pennetta last year, will play Spain's Carla Suarez Navarro for place in the quarter-finals. Suarez, also celebrating a birthday Saturday as she turned 28, defeated Russian Elena Vesnina 6-4, 6-3. Sixth seed Venus Williams, whose seven Grand Slam titles include US Open crowns in 2000 and 2001, coasted into the round of 16 with a straightforward 6-1, 6-2 win over German Laura Siegemund, setting up a tough meeting with 10th-seeded Karolina Pliskova. The hard-hitting Czech, who shocked Angelique Kerber in the final of the US Open tuenup in Cincinnati, defeated Anastasia Pavlyuchenkova 6-2, 6-4.